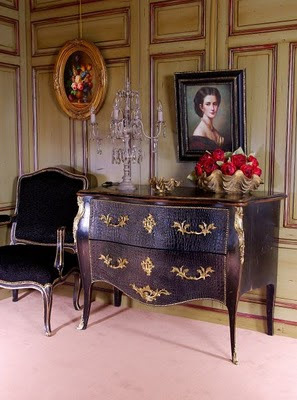 After the transition period of the Regency style flourishes and French influence over Europe. 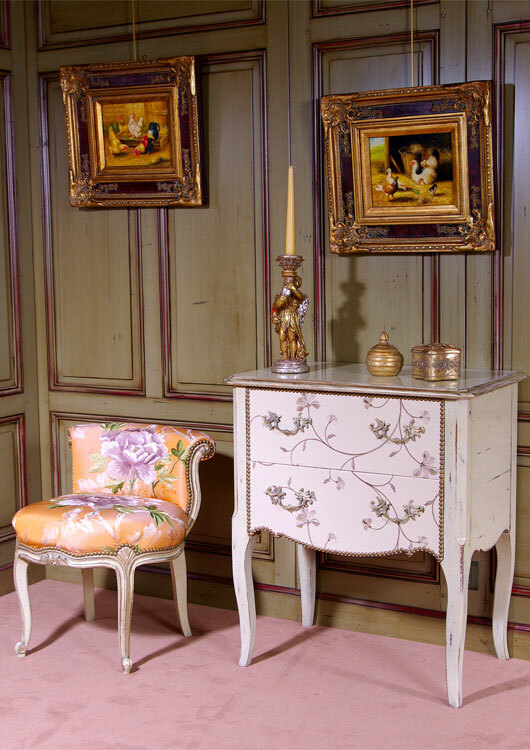 The Louis XV is required for over a century and meets the desires of comfort of the nobility and the bourgeois. Early eighteenth century, the label is less important, the company becomes more frivolous. She loves the game Louis XV table , the quiet. 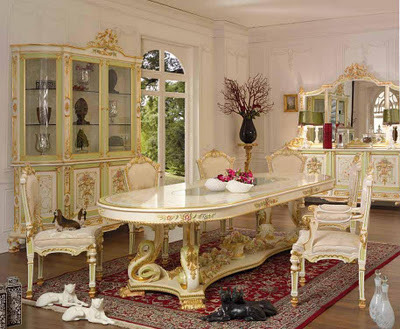 The pieces are more intimate and more rational and specific (den, small and large lounge, music room, ...). This diversity results in the creation of new furniture, including more comfortable seats. The quality is exceptional seating. Among the big names of carpenters seat, history remembers Boulard Cresson, Delanois, Gourdin or Nadal. Upholsterers, except by through inventories remain anonymous. 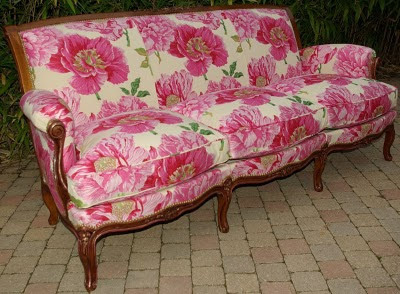 Many varieties of seats in several places, serving in the conversation are generated by the workshops, like the French sofa (similar to the chair and without cheek), the sofa with a pillow, cheeks filled like a shepherdess, the ottoman or sofa cushion-shaped gondola and Turkish origin, or the famous couch confidant, having at its ends with two armchairs corners, separated by the cheeks. 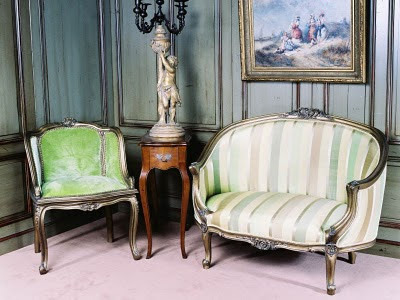 The easy chairs are numerous: the Duchess, who is a couch, the night the cheeks of different heights, turquoise or sultana is a kind of bench to bedside two equal ending with a stick that moves along a wall. 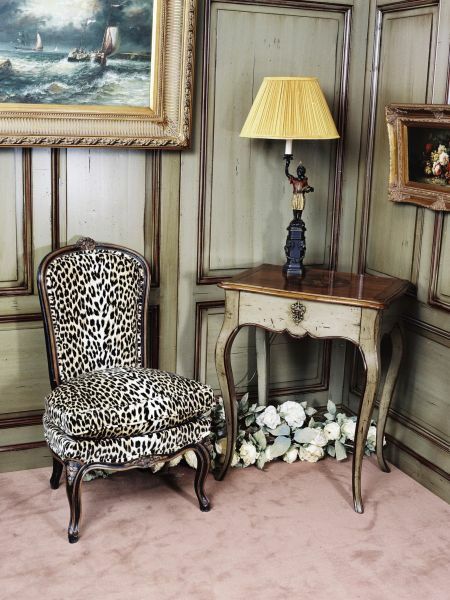 The wood takes a twisted form and sculpture is abundant at the end of the reign of Louis XV. The lines are made of curves and cons ogee curves. The record, violin-shaped, lies off the bottom, leaving a space between them. Consoles and Louis xv desks are much back armrests and flare. Fashion dresses being the baskets, the women must sit with ease. The models are rich with sculptures depicting flowers (especially roses), grenades exploded, acanthus leaves and shells complemented by foliage, staples simulating an anchor or rock more or less tormented. 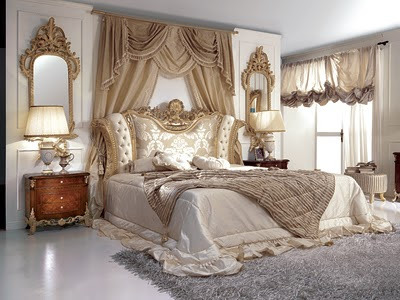 The front legs are made of elongated curve ending in a volute, or an acanthus leaf molding. The rear legs terminate in a camber. The front gets a trim. The seat is light and elegant. The rear seat, in plan view, becomes semicircular. The folder will turn into a curve to follow the shape of the bottom. The chair or chair-back will wrap-called "convertible". The headline is always less important. The spacer goes. An important novelty is the creation of the seat undercarriages, which allow you to change the decor with the seasons or receptions. Greater variety of woods are used. Most of these seats are painted where the futility of employing particular species. Varnishes are treated. The seats are sometimes embellished with sculpture in gold leaf, as in the case of royal seats. The liner is longer. Seats for cane, the cushion is replaced by a square dive. The cushions are filled with feathers or down. The assembly is hidden and perfect finishes.